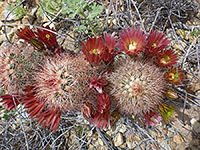 Echinocereus chloranthus is an attractive species, growing up to ten inches tall and covered by dense brown, red or white spines; color is quite variable. The range is limited to certain locations in the Chihuahuan Desert of far south New Mexico and west Texas, in particular the Franklin Mountains of El Paso, along the Rio Grande and in Big Bend National Park, where the plant is locally quite commonplace, in all areas apart from the upper regions of the Chisos Mountains. 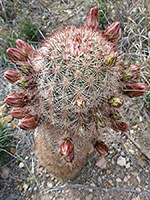 The plant is also classed at echinocereus viridiflorus var. chloranthus.